Gateway: Choose your sms gateway. 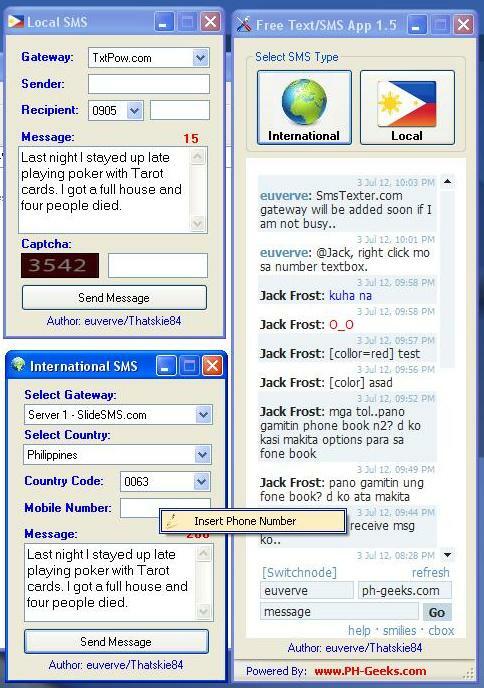 like in the picture he choose Txtpow.com but i recommend to use Textph.com. Sender: Put Your Name Here To Know The Receiver That You Texted Him/Her. Recipient: Choose The First 4 Number In The Combo Box. Then Put The Remaining 7 Numbers in The Textbox. Message: Type Your Sms Here. Captcha: Type The Text In The Textbox That Shown In The Image. Select Gateway: Choose your sms gateway. Its automatically choose the country code when you choose your country. Mobile Number: Put the remaining numbers. Message : Type Your SMS Here.